There is a war memorial in Fulham Library. It is a plaque to honour Corporal Edward Dwyer, who was the youngest person to be awarded the Victoria Cross. So great is the prestige of the Victoria Cross that it takes precedence over all other orders and medals in Britain, and recipients are entitled to add V.C. after their name. Only 1,348 crosses have been awarded since the honour was instituted. The medal is bronze (originally cast from Russian guns captured in the Crimean War), depicting a lion on a crown with the inscription “For Valour,” while the reverse side has the date of the act for which the decoration is bestowed and the name, rank, and regiment of the recipient. The VC was for any rank, not just for officers. (Encyclopædia Britannica. Encyclopædia Britannica Online Library Edition. Encyclopædia Britannica, Inc., 2014. Web. 10 Mar. 2014. For most conspicuous bravery and devotion to duty at “Hill 60” on the 20th April, 1915. When his trench was heavily attacked by German grenade throwers he climbed on to the parapet, and, although subjected to a hail of bombs at close quarters, succeeded in dispersing the enemy by the effective use of his hand grenades. Private Dwyer displayed great gallantry earlier on this day in leaving his trench, under heavy shell fire, to bandage his wounded comrades. Dwyer was born 25 November 1895. He was killed in action in the Somme 3 September 1916 and is buried in a war cemetery, Flatiron Copse, France. There are hundreds of lads in the Army who are only 17 years of age, but they said they were 18, and if they can do it, so can you. The reverse of the picture suggests this was found on Corporal Dwyer at his death. He married Maude Barrett-Freeman(Billie) a nurse in 1915. Below is a plan of the battle, showing the location of each man awarded the VC. Dwyer is highlighted in green. The Battle of Hill 60 (17 April – 7 May 1915) took place in Flanders, south of Ypres on the Western Front. 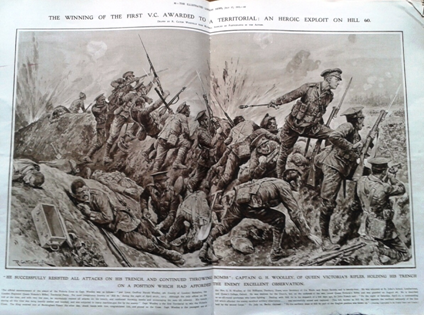 Illustrated London news 17 July 1915. Photographs of decorated officers are in plentiful supply throughout the war. In this picture, Captain G H Woolley holds his trench. ‘How the capture of Hill 60 was made possible – the explosion of a land mine under an enemy trench. As part of the commemoration of World War 1, a group of children from St Thomas’s School came to the library to attend a talk on Corporal Dwyer and see the plaque. It was lovely to see the class look through the illustrated London News and they asked lots of questions. Fulham Library have assembled a display on Edward Dwyer and World War 1. I hope you will come along and see our display at Fulham Library and perhaps spend a moment or two of respectful silence at the plaque, which can be found at the top of the stairs by the doors to the reference library. The Archives service is administered by the City of Westminster Archives Centre and is open every Monday from 10.00am to 4.00pm. Access is by appointment only and places are limited. To book a seat, please call 020 7641 5180 or email archives@westminster.gov.uk. This entry was posted in Archives & local studies, Fulham Library and tagged Edward Dwyer, First World War, history, Lance Corporal Dwyer, plaque, WWI. Bookmark the permalink.